The students got right to work cleaning the upweller & the silos using sponges and brushes to ensure the oysters have a clean environment in which to grow. The kids worked hard and were wet and slimy after the cleaning session (hands-on learning at its best!). 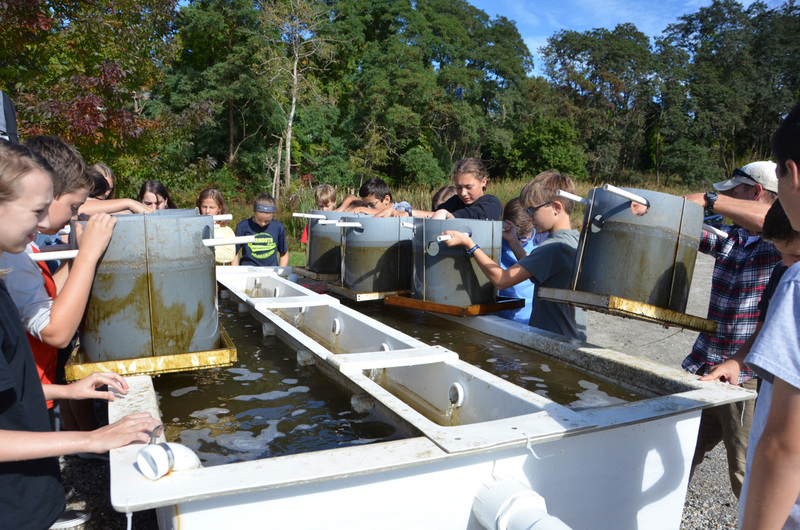 It's very exciting to see a new batch of students learning about local aquaculture. After ten thousands oysters were delivered in August, Morgan & Thomas Henninger divided them into 2 groups. Seven thousand of them currently live in the upweller and three thousand of them live in oyster gros in Casco Bay. Next week, the oysters in the upweller will be transferred to the oyster gros, which can be found in three spots: Broad Cove, Little John, and off the Cousins Island Bridge. Remember the students who started this endeavor with Morgan several years ago? Well, those students are now Seniors! If you get up early enough, you can find those students on the dock at 5:30am, boarding Thomas's boat to check on the oysters. Using the equipment they purchased from the latest YEF grant, they review the water quality and conduct productivity studies. They are researching the best places to grow oysters in Casco Bay. Thomas shared the pictures below of their early morning adventures. The next step is to bring in the drones (which was also part of the latest YEF grant)! The students will use the drones to survey local areas, checking on the best location to grow clams and mussels. They will search the locations where the clams and mussels are growing in abundance. 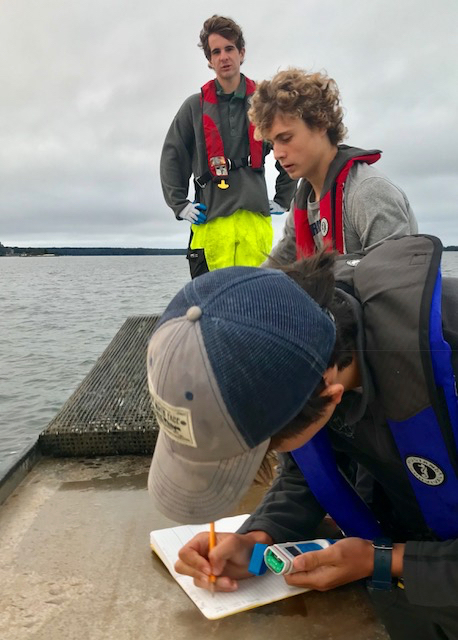 It usually takes 2 1/2 years for oysters to grow, but Morgan and Thomas are discovering that the oysters grow very well in our waters and may be ready earlier than expected. When the time comes, the oysters will be sold to local chefs. 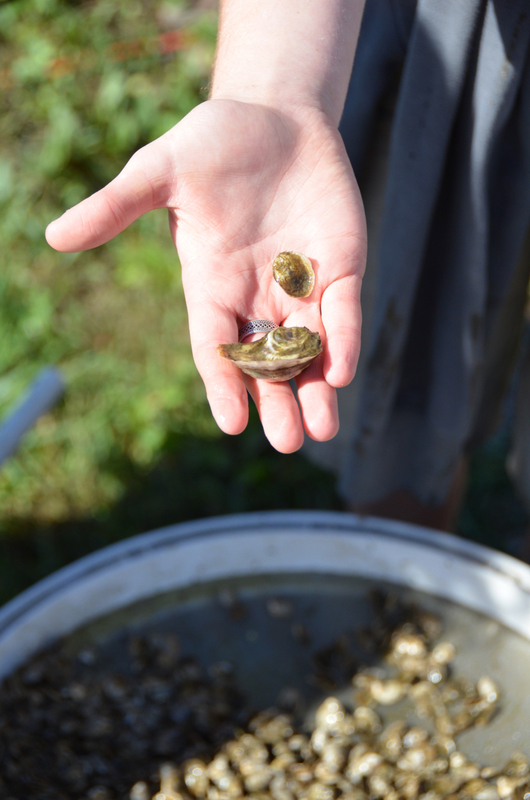 From clams to oysters, Morgan has provided his students with an education about aquaculture in our own backyard. A special thank you to Morgan and Thomas for all their efforts!